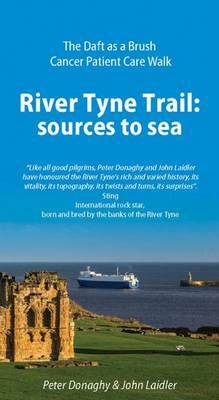 The trail traces the length of one of Britain's greatest rivers, the Tyne. The 130 mile walk covers both sources, the North and South Tynes, which are marked by giant stone monuments. The stone at the North Tyne, near the England-Scotland border, was erected in October 2013 specially to mark the beginning of the trail. From tiny springs to streams and then vibrant rivers, the two sources eventually converge to create the powerful River Tyne as it journeys to the sea. The nature of the undulating terrain makes for a challenging and rewarding experience as the trail passes through some of Britain's most beautiful and interesting scenery. This book is the brainchild of former businessman Brian Burnie, the founder of the Cancer Patient Care Charity 'Daft as a Brush'. Brian hopes that this walk will promote the work of the charity which provides individualised transport for patients requiring cancer treatment.